View More In First Aid Supplies. 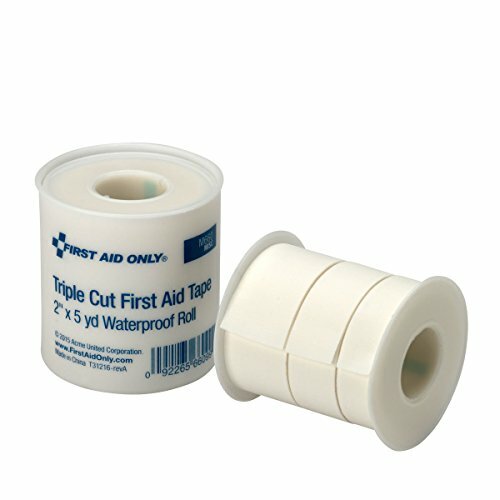 SmartCompliance Refill with 1 roll of 2" x 5 yd Triple Cut First Aid Tape. The waterproof, triple cut adhesive tape has a 3-in-1 plastic-spooled design which makes measuring, cutting, and application easy. The roll combines three available tape sizes: 3/8" x 5 yd., 5/8" x 5 yd., 1" x 5 yd. The adhesive tape is durable but breathable and holds bandages in place or secures other dressings that mold to body contours. The adhesive keeps the tape securely in place and is easy to remove without pain or shredding of the tape. This refill is used in First Aid Only SmartCompliance cabinets: 90732, 90829, 90830, 90831, 90832, 90833, 90834 and 90835.